This plate is marked as American Ironstone by Enco National and features the Baptist Conf. Glorieta Center Holcomb Auditorium. It measures 10 1/8 inches in width. 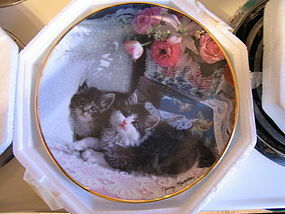 There are no chips, cracks, breaks, rough rim and little, if any, loss to the finish. I need your zip code to calculate the postage. 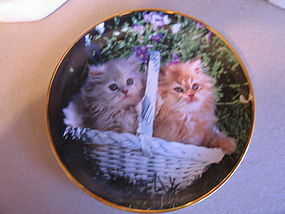 Marked as Knowles Franklin Mint Nancy Matthews "Ladies of Leisure" plate. No damage. Original styrofoam box and brass stand, but no paperwork. Others in series available. I need your zip code to calculate the postage. 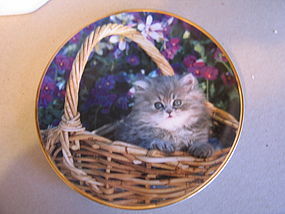 Manufactured by Knowles and marked Franklin Mint Nancy Matthews "Purrfection" plate. No damage. Original styrofoam box and brass stand, but no paperwork. Others in series available. 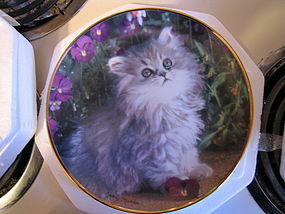 I have the figurine marked as "Purrfection" available for purchase. I need your zip code to calculate the postage. 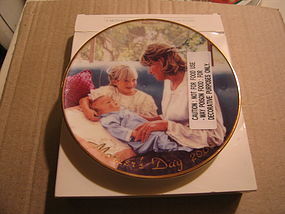 Manufactured by Knowles and marked as Franklin Mint Nancy Matthews "Bundle of Joy" plate. No damage - original styrofoam box and brass stand, but no paperwork. Others of the series available. I need your zip code to calculate the postage. 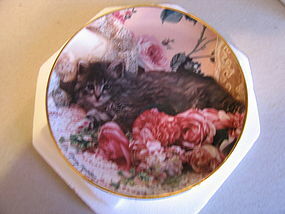 Manufactured by Knowles and backstamped and signed as Franklin Mint Nancy Matthews "Bed of Roses" plate. No damage. Original box and brass stand, but no paperwork. Others of the series are available. I need your zip code to calculate the postage. 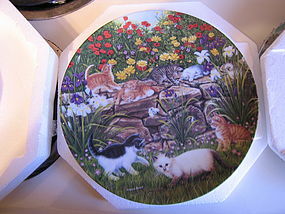 Backstamped Franklin Mint Nancy Matthews Flower Fanciers plate. No damage, original box (no paperwork) and brass stand. Others of series available. I need your zip code to calculate the postage. 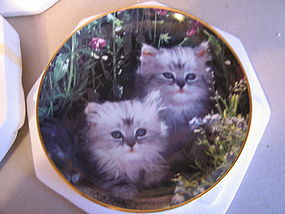 Backstamped and signed Franklin Mint Nancy Matthews Purrfect Pair Plate. There is no damage and comes with original box and brass stand, but no paperwork. Others in the series are available. I need your zip code to calculate the postage. Marked as Out on a Limb. No damage and comes with original box and brass stand holder, but no paperwork. Others of the series available. I need your zip code to calculate the postage. Identified as Side by Side. There is no damage and comes with box and brass stand holder. There is no paperwork. 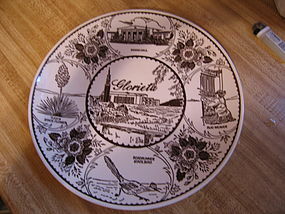 Other plates in the series are available. Backstamp photo by email. I need your zip code to calculate the postage. 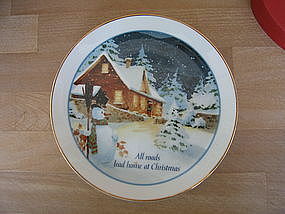 Knowles Higgins Bond plate. There is no damage. Original box but no paperwork. Photo of backstamp by email. I need our zip code to calculate the postage. 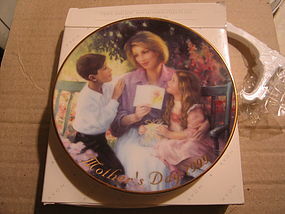 Backstamped Franklin Mint Nancy Matthews. There is no damage. Original box and brass stand, but no paperwork. Others in series available. Photo of backstamp by email. I need your zip code to calculate the postage. 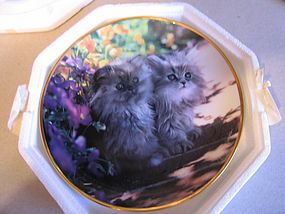 Franklin Mint Nancy Matthews plate. There is no damage. Original box and brass holder, but no paperwork. Others of the series are available. Photo of backstamp by email. I need your zip code to calculate the postage. 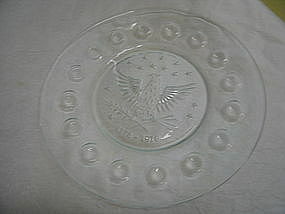 Eagle plate in the series manufactured by Anchor Hocking. 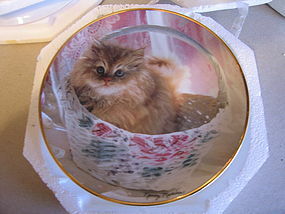 It measures approximately 8 inches in width. It has no chips, cracks, breaks or rough rim. I have others of the series available. I need your zip code to calculate the postage. 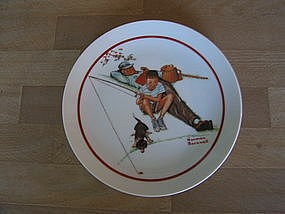 Vintage 6 1/4 inch plate manufactured in Japan. 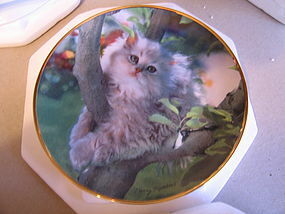 It is marked A Special Edition Collector's Plate Produced on Fine Porcelain. There are no chips, cracks, breaks or rough rim. I need your zip code to calculate the postage. 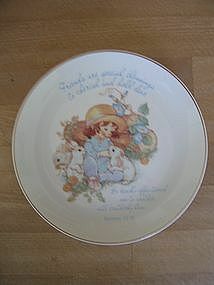 American Greetings 6 inch plate dated 1986 and manufactured in Japan. It has no damage and comes with the original packaging. I need your zip code to calculate the postage. Marked as Gentle Hearts American Greetings Japan 1983. It measures 6 inches. It is coming straight from the original packaging. It is very difficult to get the words to show up because it is a pastel shade. I have close-up photos of the text, available by email. I need your zip code to calculate the postage.